No, actually, it doesn’t. NPR has long since abandoned its commitment to provide unbiased news, and instead consistently promotes the left’s agenda at every turn with misdirection and misinformation. A recent example involves a report on refugee resettlement by NPR’s Zoe Chace. Focusing on a forum held in St. Cloud, Minnesota, the reporter dissects a presentation by local activist Ron Branstner on the current refugee resettlement program. Chace skeptically mentions Branstner’s claim that each refugee costs taxpayers $14,000. Citing an incorrect source she states flatly that the study “has been discredited.” The statistic comes directly from the Organization for Economic Cooperation and Development, which estimates the first year federal resettlement cost at $14,708. OECD notes that this excludes all state and local costs, which are significant. In fact, Middle Eastern refugees cost an average $64,370 in the first five years, or $257,481 per household. Amarillo, Texas, 30 days of tutoring costs $1,300/student. Feds provide $100/student. Feds demand refugee students learn English in one year. Manchester, NH: 82 languages spoken in high school – school ratings among lowest in state. 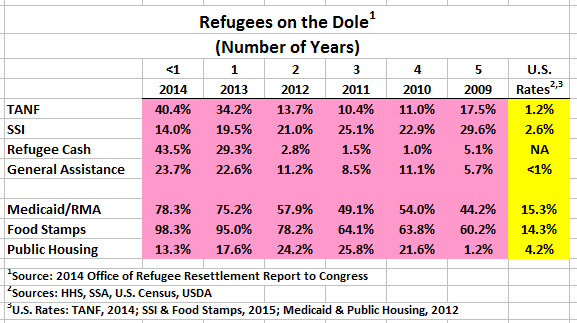 Furthermore, refugees use welfare at excessive rates for many years (see table). Those who start successful businesses are a tiny minority. The average wage of refugee employees was $9.59 in 2014, the most recent data available, and similar in prior years. At this rate, most refugees will pay no taxes. Instead they will receive an Earned Income Tax Credit refund. Facts are stubborn things, as John Adams said. People who rely on them tend to repeat them to others. This is how most of us learn. We read carefully sourced, factual articles that make a convincing case. Once a fact is established, it is only natural that others interested in the same issue will repeat it. So, yes, many times we do all say the same thing, because it is the correct thing. Unfortunately for the left, our accurate reporting restrains their effort to dominate the narrative and advance their agenda. So they resort to the hackneyed “xenophobe,” “hater” meme. The reporter identifies Refugee Resettlement Watch and Creeping Sharia as “being informed by” ACT! and CSP. Neither is true. RRW has been reporting independently on the refugee resettlement program since 2007. It answers to no one. It’s author, Ann Corcoran, wrote Refugee Resettlement and the Hijra to America, a best seller at Amazon. CSP published it in recognition of Ann’s expertise on the subject. Chace should read it. The reporter then says, “These poll numbers have been discredited.” By whom? When? Offering no credible sources, we are supposed to just take her word for it. But the poll is accurate. And there are others that back it up. Even a Pew poll finds that in most countries around the world, a majority of Muslims believe in shariah law. We all know that most NPR funding comes from private sources, but we need to seriously consider zeroing out the approximately 16 percent that comes from taxpayers. Perhaps the program would then get the message, or if not, would at least be required to raise all the money needed to push its left-wing agenda.